... 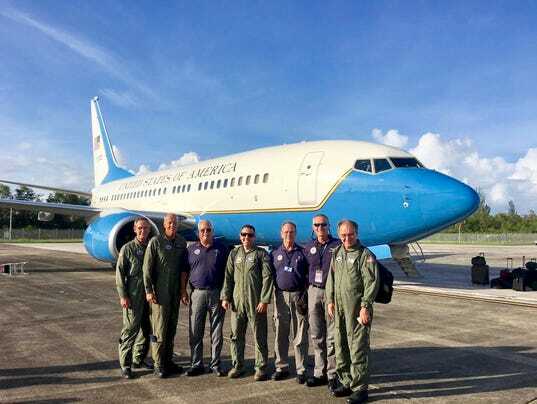 Meanwhile, in Puerto Rico, slammed by Irma on Wednesday, six volunteers from mainland CAP units were deployed Friday to provide support for the wing's aerial assessments and photography missions for federal relief agencies. They are flying to PRWG now?! Isn't that like, a really bad idea, especially over water? Yep. One of them from my Squadron. Being a marketing guy I'm chomping at the bit wanting to spread the news around in the media , but PIO folks asking me to hold off until Hdqs approves everything. We even have some great photos of the 6 in front of the USAF 737 they took. But told not to use them. They have been there via 737 many hours ago. I suspect Eclipse thinks you had originally meant they were getting there in a CAP plane.. But then again, thats how SER swaps planes with PR. Its not like they get miracled there. Yes, but not into a storm with 100MPH+ winds. I'm sure our guys in the USAF 737 got a nice view of it while flying well above it. USAF doesn't use a 737 for cargo or pax (DV bird is the exception) your data is flawed.. Yes. DV aircraft. I'll post the photo as soon as the PIO lets me. (Darn these OPSEC people. LOL) Clue is that while AF, its painted sorta like a Presidential plane. Can we give the guy the benefit of the doubt absent further data? The USAF does use 737s as for pax as the C-40B or C-40C. They don't use them for cargo in the same way they transport cargo in the KC-135/C-137 or KC-10 variants, but surely they can put *some* "cargo" in the aircraft in the same way the airlines can (ie. loaded in the belly). He said 737. The man is a pilot. I can assume that he probably, maybe, likely, can identify a 737 or a 737 variant 3 out of 4 times without flashcards. Very nice. I see some of my WESS colleagues in that photo. The crew wasn't just DV ... they were VERY DV. DV is the new chic word?